I have two pieces of advice to offer entrepreneurs who are just getting going. First, find a mentor–someone you admire in the field you’re most excited about–and offer to work for them for free. Think of it as a free graduate education. Your mentor can offer you ‘a seat at the table,’ where you can learn from real-world experiences at the highest level. Going back a few centuries, apprenticeship was critical to one’s success, and I believe the concept of apprenticeship is valid once more. 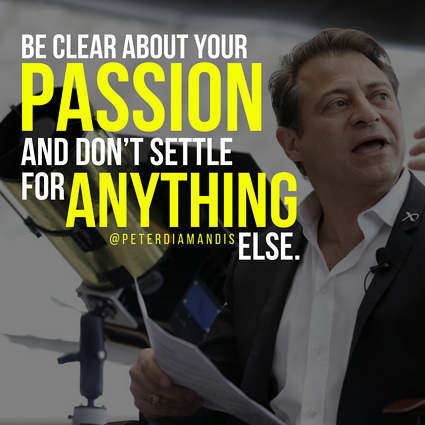 Second, be clear about your passion and don’t settle for anything else. Don’t do something for the money, or to make your parents or your teachers happy. Pursue a startup business because it’s your personal passion, your highest aspiration. If you do something you are passionate about, you will work harder than ever before and outshine anyone. Doing anything big and bold is difficult, and if you’re not totally in love with what you’re doing, you’ll give up before you succeed. For me, my passion for space has motivated me since childhood. I see two common mistakes young entrepreneurs make when getting started. First, they tend to go with the crowd and chase startup ideas based largely on the past successes of other popular entrepreneurs, rather than pursuing their own personal passion. There’s no need to add another photo sharing app (unless, of course, you are deeply passionate about doing so). Second, I see many entrepreneurs focusing on making money rather than pursuing their passions or their dreams. They’ll pursue a business concept that they think has great potential for making money, even though they don’t love the field they’re in. What almost everyone finds at the end is that creating a massively successful business is hard, and, again, if you don’t love what you’re doing, you’ll give up before you succeed. So where do you get your idea for a startup? Don’t have an idea for a startup yet? Read more! Historically, I’ve come up with my best ideas when reading a book. I view reading a book as engaging in a conversation with the author. For me, three books made the biggest impact: The Spirit of St. Louis by Charles Lindbergh gave me the idea to start the XPRIZE Foundation. The Singularity is Near by Ray Kurzweil gave me the idea to co-found Singularity University. And The Man Who Sold the Moon by Robert Heinlein gave me the idea for the Google Lunar XPRIZE and the work we’re doing with Planetary Resources to prospect and mine asteroids. In addition to reading books, I’ve also come up with my best ideas when brainstorming with friends and colleagues who I respect, and who bring different perspectives (or areas of expertise) to the table.